The January 12th Islander cover featured an amazing picture of a Bald Eagle taken in South Hero near the Sand Bar Marina. We were wondering who else has seen this amazing Eagle? Do you have any stories or photo’s to share with our viewers? Please post any eagle sightings here. If you have photo’s please submit them to blogphotos@lakechamplainislander.com and we will be sure to get them posted on this page in the coming weeks! I’ve heard of the sightings in North Hero. I can’t wait to spot it for myself! Seems like we are not the only one looking for Blad Eagles here on the Islands. A two day annual Census count in Massachusetts totalled 71 birds. 45 Adults, 25 Juveniles andone of undetermined age. This count was down from the 81 counted the previous year. Does anyone know of an official count in Vermont? I saw a bald eagle in the middle of the lake, eating a fish on the ice smack between Rouses Point and Alburgh just off the bridge. We saw a bald eagle eating a fish on the ice on the west shore of Isle Lamotte, near the shrine, a couple of weeks ago. We have a summer home on Poor Farm Road in So. Alburgh. I saw the eagle sitting in a tree on March 23rd at about 7:00am. It was right next to the road on the lake side of Poor Farm Road approximately a mile down the road. Went back to the house to get my camera and by the time I got back it had flown off. I also got my wife out of bed to ride back with me …. she wasn’t too happy!! Getting ready to leave for the office, 4 years ago, I saw something out of my kitchen window that caught my attention. I thought it was a couple of turkeys on the ice. Got the binoculars and I saw two eagles, on the not too frozen lake span in front of our home in Alburgh. I called my husband Larry (at the office) to confirm this for me. Meanwhile, one of the eagles had flown off and returned with a huge “pink fish” in it’s talons and dropped it on the ice flow. The two began tearing into it as it flopped on the ice. Meanwhile, groups of crows, seagulls and other scavenger birds had gathered around patiently awaiting their pecking order. At that point Larry had arrived and could not believe his eyes. We watched, not so much in disbelief, but to the fact we were priviledged to be witness to our very own “Nature Show”. Unfortunately, I did not capture the moment on film. Which is why, today, I am a camera freak!!! May 23. Our friend, Merrill Hemond, spotted a Bald Eagle this afternoon soaring over the tops of the trees past the back of our house toward the Fisk Quarry. An impressive sight! An eagle has been sitting on a rock off the shore north of the Rouses Point bridge the last few mornings. Today it came back around noon to eat a fish there. My husband first spotted it in May. 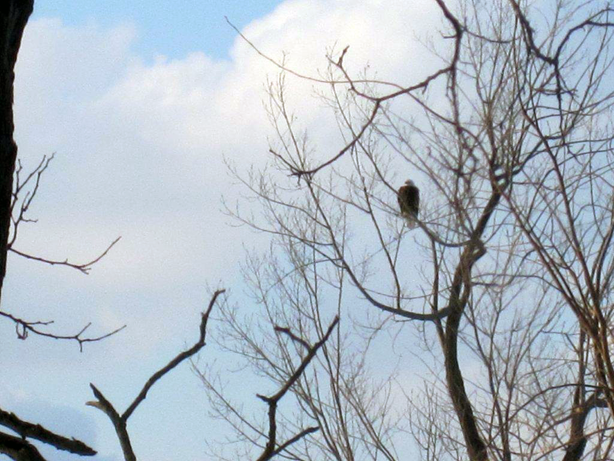 My husband and I had two Eagles sitting in our neighbors tree in the early spring. They stayed around for two days. Then we have seen a single Eagle flying around our home off and on this summer. Yesterday we heard an Osprey scream and saw it drop a bowpout fish in our pasture. There was an Eagle circling near the Osprey. We live on Georgia Shore in Vermont, near St. Albans Bay. 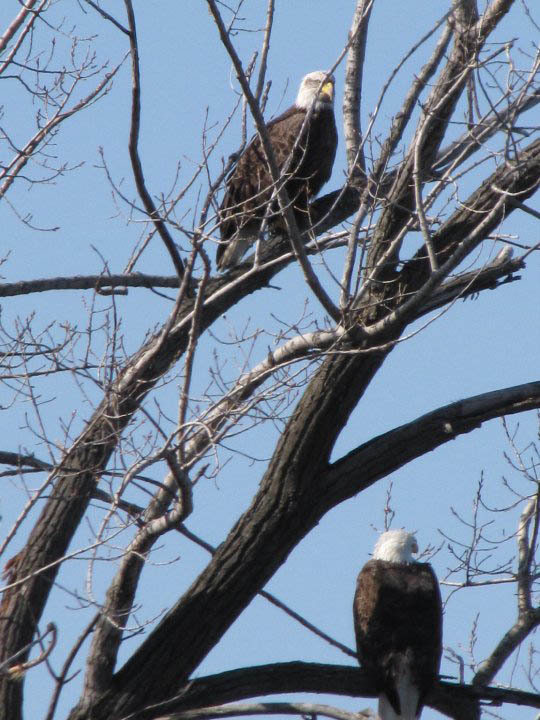 I have some great photos of the two eagles sitting in the neighbors tree! We have seen eagles in our area for the past two-three years. Last week, Nov. 8th at 9:30AM a bald eagle was sitting in the top-most branches of a dead cottonwood tree on the lake side of East Shore Road. He flew away once and came back, but unfortunately we could not get a picture of him. When he left he flew large slow circles over the lake and disappeared over the west shore of the Tongue of Alburg. Driving toward Routh 2 on Lombard Lane in South Hero, we saw a bald eagle flying low followed by an Osprey. The birds were flying East. It was before noon. It was in July. Earlier, in Fall of 2009, we saw a bald eagle sitting on a stake as we were driving North on Route 2 as we approached the Sand Bar Bridge from the mainland. On Saturday, November 27 while driving north on Rt. 2 we saw 2 mature and 2 juvenile bald eagles flying and roosting in trees in the marsh on the northeast side of the causeway just east of the Sand Bar State Park. We saw an eagle this morning (March 28). It was standing on the Inland Sea ice about 1 mile from the Grand Isle/North Hero drawbridge. i think i saw the eagle twice in 2011. we flew over my head on north end road, north hero. my neighbor said he saw one on the alburgh side of the lake. so we think it is the same bird. I’ve seen the eagle in North Hero, by the draw bridge, more than once, these were adults. In 2010 and 2011. I have recently seen an adult (twice, seperate occasions) by the sanbar but also saw a young eagle there as well.This was 2011 for all of these sightings. To slow with the camera but still trying. 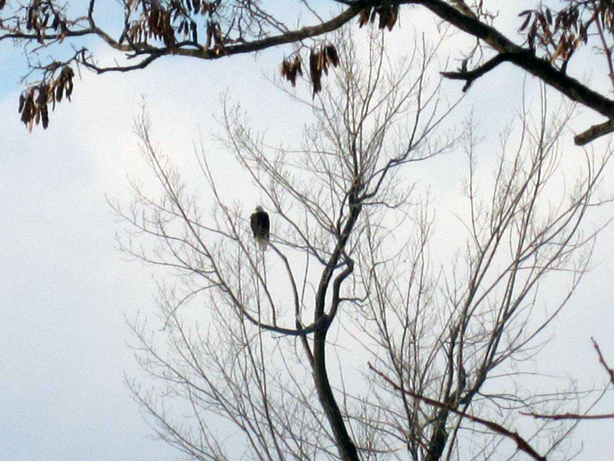 Just yesterday we had a bald eagle in a tree at our home in South Hero. He was also a visitor to our home last winter. 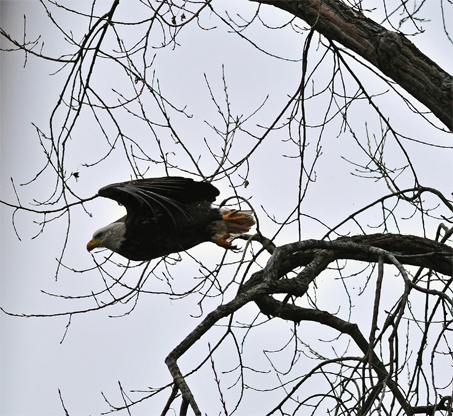 I saw an eagle perched on the trees at the intersection of West Shore Road and Middle Road in Albugh in early January. The Eagle was amazing! In January a friend saw a mature eagle eating on a deer carass on the lake in front of the Alburg Country Club. Danielle again, I saw an eagle for myself in the exact location of the post above on February 22. Could very well be the same one. I wanted to share a website with everyone who is connected to the Islanders Blog. This website is a live broadcast of a bald eagle’s nest in Decorah, Iowa. The Raptor Resource Project installed and maintains the camera. The pair of eagles in the nest are currently incubating three eggs, the first expected to hatch around March 23rd. This is an incredible place to learn about the bald eagle, and watch the little eaglets hatch, grow and fledge. 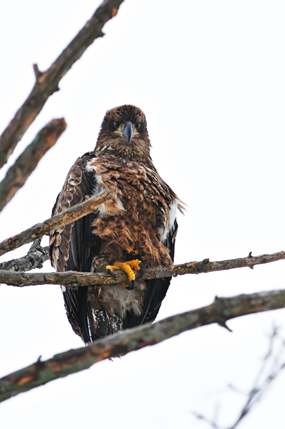 March 21 & 22, 2012 – East Shore Rd., Isle La Motte, around 10 AM a juvenile eagle and a mature bald eagle were spotted on the tops of two trees about 500 ft., across our hay field directly. For 2 years in a row a eagle has shown up on our property and sits in a particular tree for at least two days. I view him as our own Punxsutawney Phil. He is a beautiful sight that lets us know spring is coming. No photo but I saw a bald eagle for the first time in my 24 years in Vermont today while running on West shore road on the north shore of Sawyer Bay. I interrupted my run to get a closer look, what a treat. Unfortunately I am no birder and got too close and made it uncomfortable and it flew away. It was huge, dark body and white head. Caveate, about a month ago while running, I saw a huge bird on a foggy day up in a tree at White’s beach. It was not shaped like the Ospreys, it was shaped like an eagle. Due to the fog & lighting I could not tell its colors since I really just saw the silhouette. I excused it as not being an eagle because I never saw a bald eagle in Vermont and assumed there were none here. Today’s sighting was too explicit to excuse as anything else. The one from last probably was too now that I know they are here. Check the cover of this week’s Islander (March 19 edition) for a picture of an immature Bald Eagle feeding on a Great Black-Backed Gull that it had killed. 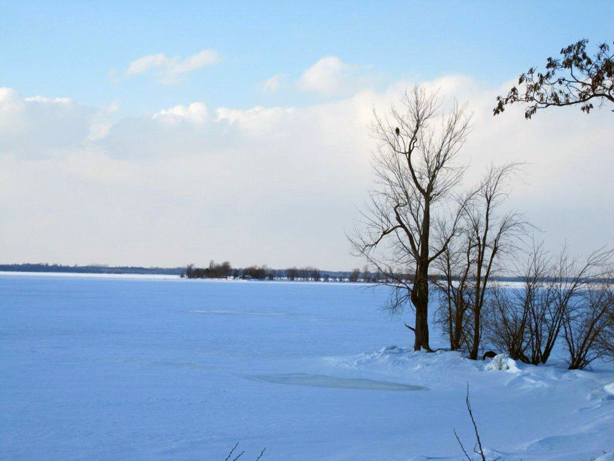 Photo recently taken on the Alburgh shore, not far from the Alburgh-Rouses’ Point bridge. There are also pictures of mature Bald Eagles on the Islander facebook page. Those pictures were taken a few weeks ago near the bridge. 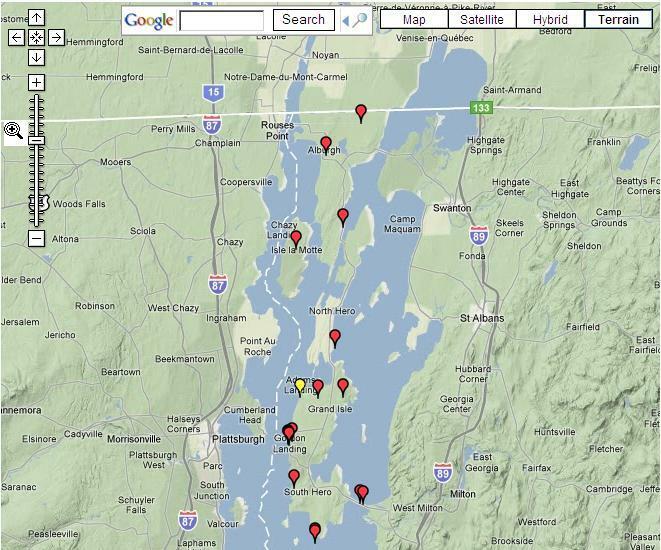 Covers “The Islander | Lake Champlain Islander Weekly newspaper Blog”? It also has quite a bit of decent material. This blog is an ongoing creation, the general site was created in a week or so. If you have material you would like to add please email it to us and we will upload it to the site. 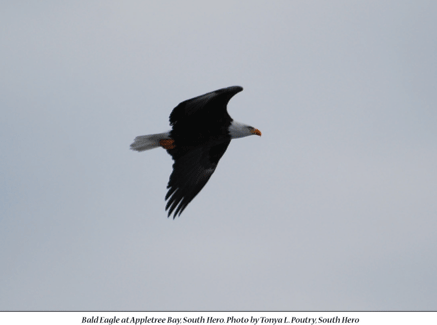 I saw 1 bald eagle on the north hero state park in May 2014. It was beautiful. Unfortunately I haven’t seen any since. Hoping to this summer.